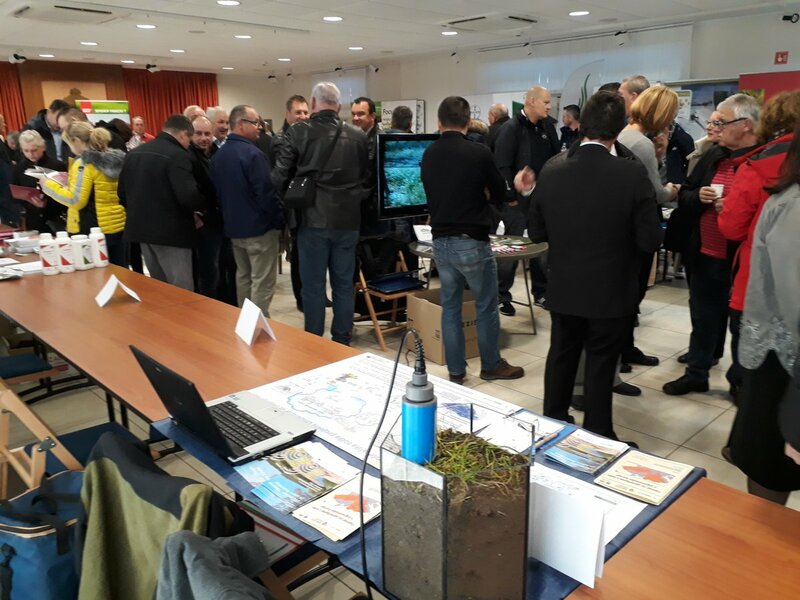 After a round of national briefing seminars, DriDanube partners are currently busy with further involvement of national stakeholders in development of the project outputs that will serve their future needs. One of the most practical outputs expected to be widely used by national authorities, and end-users such as farmers, foresters or water managers, is Drought User Service (DUS) - an innovative tool for more accurate and efficient drought monitoring and early warning in the Danube region, integrating also unified methodologies for risk and impact assessments. The DUS entry data from satellites and ground meteorological stations will be further validated and complemented by on-field reporters who will weekly report on drought impacts in their own district. The on-field reporters - farmers, fruit-growers, winegrowers or foresters – will provide a regular feedback on vegetation status and moisture of soil. The inputs from reporters will be collected, evaluated and transformed by the system into drought status and forecast maps based on which stakeholders will be able to take appropriate actions. Infographic showing how drought impact reporting network functions. Establishing a nation-wide network of reporters is however a long-lasting process that takes few years. Our ambition is to start the whole process in each of the 10 project countries and set good foundations for its further growth after the project end. 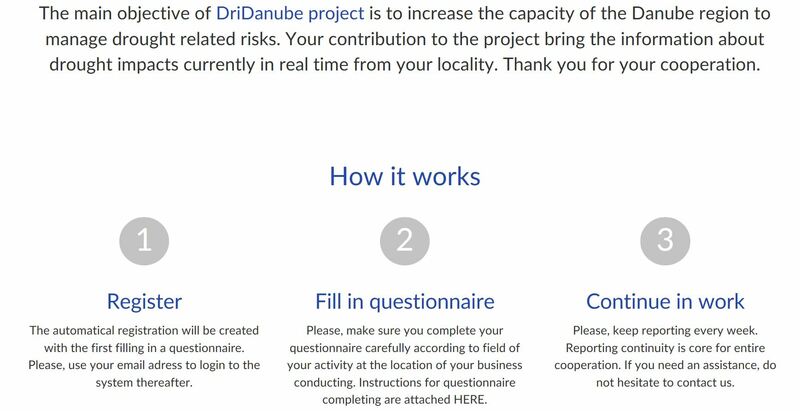 This step is the focus of DriDanube project during its duration. In order to decide to join the network, possible candidates need to be well-informed and trained on how to report their observation. For this reason, the project partners are presenting importance of establishing the networks at all fora where potential reporters might be present. They also organize seminars and trainings in order to provide all needed details of reporting system. You can read about Experiences from the DriDanube partners with establishing the reporting networks further below in this article. Once the reporters agree to join the reporting network, they register online and start filling in the questionnaire. They will spend 5-10 minutes a week replying to a set of questions within a simple online questionnaire based on observations from their field/forest/vineyard etc. This way, they will provide a regular feedback on vegetation status and moisture of soil in their area. The reporters’ responses will be collected by the system and transformed into a map of current drought status published within DUS. The following maps describing current status of agricultural drought will be available: drought intensity map, soil saturation map, soil moisture deficit map, map of impacts on vegetation, map of impacts on agricultural crops. As a result, the users of Drought User Service will be able to access map of drought impacts of the area of their interest within the Danube region. In some countries (currently in the Czech Republic and Slovakia) they can also access detailed agrometeorological forecast for their location which is free of charge. In addition to drought status maps, also 10-day forecast maps will be available: drought intensity map, soil saturation map. All these maps will be updated on weekly basis and users can access them in a detailed resolution of 500x500 m. Moreover, reporters will receive these maps on their e-mails with daily updates. They will receive the charts with a package of 5 models with a 9-day prediction of temperature, precipitation, air humidity and wind speed. Growing network of reporters feeding the system with weekly information will constantly increase reliability of data offered by DUS. This will be a win-win situation for both sides, as the system will receive reliable data from reporters and reporters will get in return more accurate forecasts to take appropriate adaptive measures. Apart from benefitting from information on current status of drought and drought forecasts needed for reporters’ own operations and strategies within the season, from a regional point of view the system may provide a reliable mechanism for farmers in selection of appropriate price negotiation strategy or building fodder stocks. Additionally, in return for provided data, reporters are offered a tool that will show how serious the problem in their area is in order to negotiate with respective offices for payments of the subsidies. Experts can easily identify drought occurrence using the soil water index (which quantifies the moisture condition at various depths in the soil) but they do not know what exactly is happening on the field, how plants are affected, how serious the current impacts of drought are. The newly introduced system aims to provide timely, regular and standardized assessments of drought impacts (including forecasts of these impacts). Reporters hence play a massive role in better assessment of one aspect of drought, the drought impacts, which is an important part of an early warning system and better preparedness. In addition, the inputs from reporters will contribute to systematic collection of drought impact data on regional basis that will support development and use of the methodology for forecasting of drought impacts. Involvement of on-field reporters is crucial for success of the project from more than validation point of view. Apart from providing valuable entry data, information from the reporters can raise awareness of public institutions and general public as well about severity of drought in a specific time and region. These reports are hence essential for timely responses not only from water-dependent/related businesses but also from the state administration. By joining the reporters’ network, every individual can help to point out the problem of drought in their region and mobilize more attention and push to tackle the problem of drought management. All 10 DriDanube countries are now working on establishing their national reporting networks, take various approaches and have also various experiences from this process. As a first step, many partners turned to existing observer networks to extend their observations also for drought impacts e.g. phenological observers (Slovenia, Romania), reporters from meteorological service (Montenegro, Croatia, Hungary), advisory service or national parks. Very good cooperation has been established with national and regional Chambers of Agriculture for whose members the partners from the Czech Republic, Slovakia and Slovenia organized a few informative seminars. 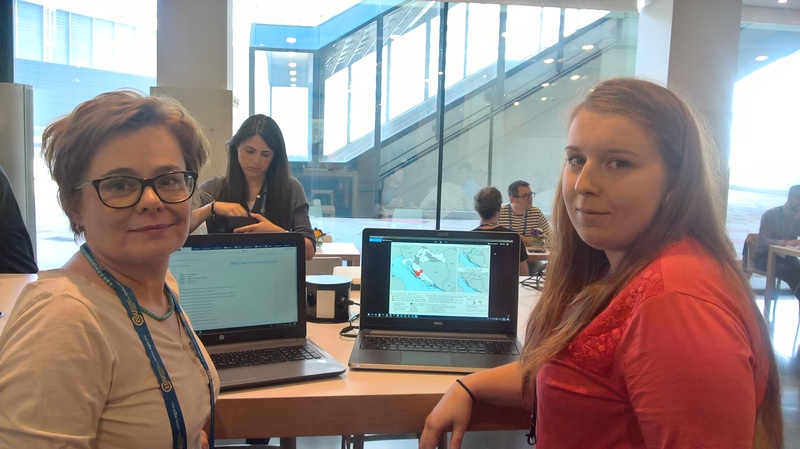 Partners in Slovenia have started cooperation with another project where in return for their observations, DriDanube can provide drought-related data. Some partners are active also in national media where they promote topic of drought impacts reporting through articles in specialized agricultural newspapers, on TV or radio. At the moment, the biggest number of reporters (433 registered, 170 active) is engaged in the Czech Republic where CzechGlobe has started building their reporting network already in 2014. Now they lead this activity for the DriDanube project and share their experiences with the rest of the colleagues. Some “beginners” are doing very well too and have been able to engage up to 40 reporters within the past few months – Slovakia, Croatia and Slovenia. 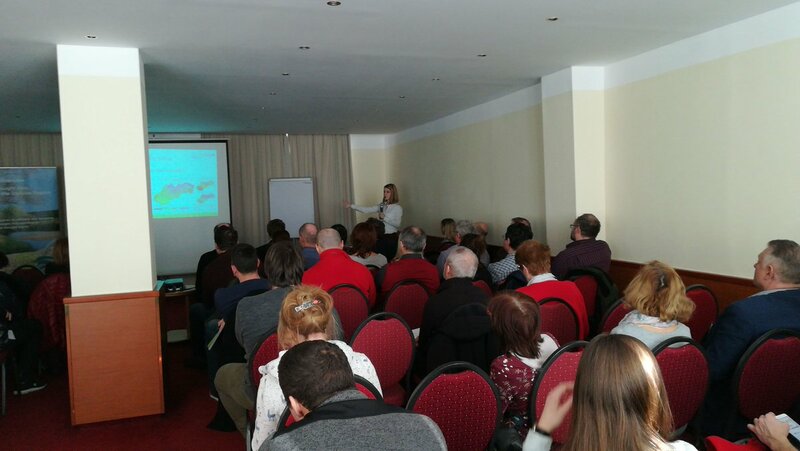 The Czech and Croatian partners discussing drought maps and online questionnaires for Croatia, April 2018. The major problems that partners are facing during this process is the requirement of weekly reporting that is considered too frequent by some reporters. This is however important for data continuity which is crucial for subsequent use of data in practice. Weekly reporting is also important in order to evaluate and compare dryness - it is very difficult for an individual to evaluate any longer period and compare it objectively. For the same reason any reporting for soil and vegetation condition on weeks prior to the last one is not possible. One of the good practices working well in approaching the new reporters are the user manuals (on how to register, fill out the questionnaires, FAQs) in national languages. Also, a recommended practice is to work on engaging reporters and providing any needed explanations and trainings before the season starts and reporters will be busy again on the fields. We believe that drought impacts reporting is a powerful tool to show the problem of drought in real time and also to raise awareness of the media, public and public administration about the problem. Check how the reporting works and join our network of drought reporters here.